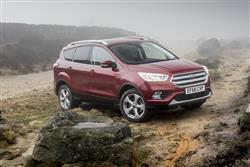 Find out everything you need to know on the new Ford Kuga from independent vehicle review website Car And Driving. You can watch the video review to the left to see more of the car or read their written review below to get a true insight from an expert in the automotive industry. Ford's Kuga has sharpened up its act in this improved second generation guise. Jonathan Crouch checks out the changes. The Ford Kuga has evolved in this improved second generation form into a more desirable proposition that'll be equally attractive to Qashqai-like Crossover and RAV4-style soft roading SUV buyers. The single five-seat bodystyle is properly family-sized and gets some clever technology that segment buyers will like. In other words, if you're shopping in this sector, here's a car you have to consider. By now, you ought to be pretty familiar with the second generation Ford Kuga. You are, right? It's like the first generation car but bigger, more efficient and smarter inside. There's still no seven seat option, but Ford reckoned that this was something only a small percentage of compact SUV buyers actually wanted. The latest model has come in for a bit of a wash and brush-up, with a restyled front end, extra safety tech and lots of fresh media connectivity inside. Otherwise, it's much as you were. The Kuga established its reputation as being one of the best compact SUVs to drive and this one should be no different. At first glance then, the news seems all good. Under the bonnet, things are much as before, which means that the petrol range is based around a 1.5-litre EcoBoost engine, though this unit is now available in three guises. The 120 and 150PS versions of this unit are familiar, allied exclusively to front wheel drive. New though, is the 182PS variant of this unit, which can only be ordered with a 6-speed automatic gearbox and AWD. Most Kuga buyers though, are going to want a diesel. Possibly the 120PS 1.5-litre TDCi unit that only comes with front wheel drive. But more probably the 2.0 TDCi engine that in 150PS form, offers the choice of either front or four wheel drive, manual or Powershift automatic transmission. If you want more power, there's a 2.0 TDCi 180PS variant at the top of the range that only comes with AWD. This has always been one of the very best family-sized Crossovers to choose if you like your driving. There's a torque vectoring control system to reduce the sort of understeer you'd expect in a car of this type and the Kuga has always performed well in terms of ride quality and refinement. This improved Kuga features Ford's latest design language for a bolder, sportier look that's shared with the company's EcoSport compact SUV and Edge large SUV models. A large upper trapezoidal grille and a smaller lower grille are flanked by sleeker headlamps incorporating LED daytime running lights. Restyled taillights complete the changes, along with revised alloy wheels, available in 17, 18 or 19-inch rims. Inside, the updates are subtle, but quite effective. So the steering wheel and air-conditioning controls are more intuitive and feature fewer and more easily distinguishable buttons and switches, making the controls easier to recognise and navigate. The steering wheel is offered with optional heating to improve comfort in cold weather, while all automatic Kuga models now feature paddle-shift controls that enable drivers to manually select gears while keeping their hands on the wheel. Extra convenience features include an electronic parking brake that frees up room for improved storage in a centre console that now also features a storage area capable of accommodating a variety of bottles and cups. There's also a new USB connection point for integrating and charging mobile devices. Otherwise, things are much as before. Which means that inside, there's decent headroom all round and reasonable rear legroom too. Out back, there's a 438-litre boot. Prices are much as before, which means a starting point of just over £20,000, rising up to around £35,000. You get a lot more technology for that though, in this revised model. Take the new 'SYNC 3' connectivity system. It delivers faster performance, simplified commands and supports the 'Apple CarPlay' and 'Android Auto' smartphone connectivity systems, so you can use your favourite apps on the dashboard's 8-inch colour touchcreen. The new Kuga also features Ford's Perpendicular Parking technology that helps drivers park handsfree in spaces alongside other cars. Plus there's an enhanced version of the 'Active City Stop' collision avoidance system. And Ford's 'Adaptive Front Lighting System' for optimised visibility in low light. Further advanced technologies include a 'Hands-Free Liftgate' powered rear hatch that you can activate by waving your foot beneath the bumper. The latest generation 'Ford MyKey' technology allows Kuga owners to programme a key for younger drivers that can inhibit incoming phone calls, restrict top speed, prevent deactivation of driver assistance and safety features, reduce audio system maximum volume and disable the audio system altogether if occupants are not using safety belts. The enhanced MyKey system also offers a greater number of choices in both the speed limiter and speed minder settings. It's all very reassuring. Ford has pulled out all the stops to make the latest Kuga more economical than before. For example, an Active Grille Shutter is fitted to all versions. This closes the front grille, reducing aerodynamic drag when the radiator isn't in need of additional cooling and then reopens it upon demand. Auto-Start-Stop is also standard across the range. Features like an Eco Mode and a Gear Shift Indicator help keep your right boot out of the carpet. All this effort has paid off in terms of efficiency. The 1.5-litre EcoBoost petrol variant manages 44.8mg on the combined cycle and 145g/km of CO2 in both 120 and 150PS guises. Go for the 1.5 EcoBoost 182PS variant and those figures fall only marginally to 37.7mpg and 173g/km. As for the diesels, well the 1.5 TDCi powerplant manages 58.8mpg and 124g/km. And the front-driven 2.0 TDCi 150PS model manages 60.1mpg and 122g/km - or 54.3mpg and 135g/km if you order it with AWD, figures duplicated by the top 2.0 TDCi 180PS AWD derivative. Ford has finally got serious about the SUV market and its three offerings now effectively cover this growing market. This Kuga certainly needs to appeal to a lot of different countries if it's to earn its corn and while some have grumbled that it doesn't feel particularly tailored to UK buyers, that's something we're going to have to get used to. Sales haven't been bad, so Ford's clearly doing something right. The latest model becomes more sophisticated and gets a bit more kit but otherwise, the script doesn't change radically. If you want to make a style statement, you'll still keep saving for a Discovery Sport. Otherwise, the Kuga is still one of the very best compact SUVs for those who love to drive.